Ex-VP Atiku has shunned Elder statesman Obasanjo and has visited former President, Ibrahim Babangida for support as he plans to contest for Presidential election in 2019. 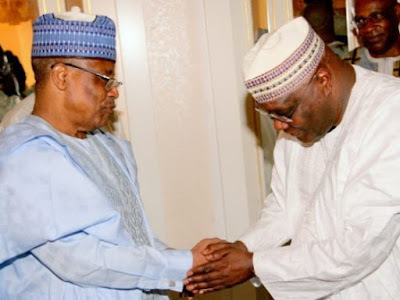 The former Vice President Atiku on Thursday arrived the Minna International Airport at 12:10 p.m. and arrived Babangida’s uphill residence 20 minutes later. The duo later went into a close-door meeting in one of the ex-President’s rooms in the villa. Niger State Governor Babangida Aliyu, Niger PDP Chairman Tanko Beji and top PDP Chieftains took part in the secret meeting that lasted for 55 minutes. Birds of these feather flock together Top corrupt bastards,imagine the gesture in that greeting,these corrupt man Atiku wants to be president by hook or crook and it won’t be to work for the citizens bt for himself, for example if I want help sick person from death like three times he no gree I no go leave am ne? only dumb Nigeria will vote these king of corruption. Maybe Atiku does not know that Babangida will tell Obasanjo everything. These are retired Generals,they will continue to service mutual respect for each. CONSULTING THE SAME OLD CABALS THAT DROVE US INTO THE MESS..WHEN WILL THE MESSIAH COME?WE NEED A STRONG CANDIDATE RANGING FROM 40-50S AGE BRACKET AND WILL NOT BE LINKED TO THE CORRUPT BASTARDS WITHIN THE CORRIDORS OF POWER.. Recycling of same corrupt minded people. Jaiyeoba on Unveiling The Degrees Of Faith!